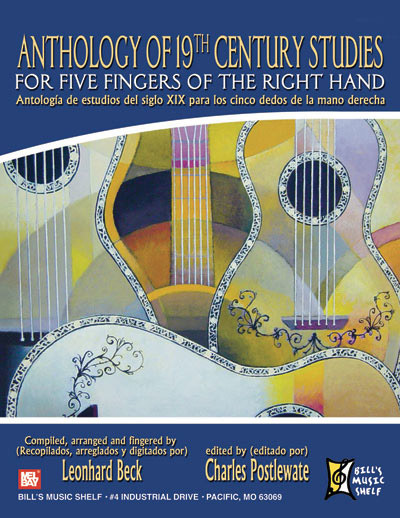 This is an anthology of beautiful easy-to-moderate level pieces by 19th century masters of the guitar: Dionisio Aguado, Antonio Cano, Federico Cano, Matteo Carcassi, Fernando Sor, and Francisco Tarrega, adapted for a modern right-hand technique that includes the little finger. German Professor of Guitar Leonhard Beck has compiled this collection with the assistance of Charles Postlewate, pioneer of the use of the right hand little finger. It shows the advantage of using the little finger in the playing of scales, chords, arpeggios, tremolos and harmonics for speed, accuracy, strength and balance. These studies make good repertoire pieces for the beginning guitarist or for the advanced guitarist who wishes to add the little finger to an already-developed right-hand technique. They are graded in three levels of Easy (7 studies), Easy-Intermediate (9 studies) and Intermediate (11 studies) for the progressive development of the right hand. An ideal companion to MB98710 – Right Hand Studies for Five Fingers: Using Chords, Arpeggios, Tremolos and Harmonics by Charles Postlewate. Standard notation only.